It is well known that health-checks within a school setting can be challenging. The Pacific Science for Health Literacy team have developed this learning resource to support the integration of student health checks into the Healthy Start to Life Education for Adolescent Programmes. To support empowerment, health monitoring must be an active learning experience. To facilitate this the project team have produced My Health Profile, a resource explaining the health monitoring checks, alongside relevant NCD risk information. The resource is specific to the Cook Islands but is easily adaptable for other settings. It does not sit alone, but is integrated into the learning module Ko Au e Toku Aorangi: Kai no te Oraanga Meitaki (Me, Myself, My Environment: Nutrition). Contextually relevant learning resources in this series are also available for Tonga and New Zealand, and are available for adaptation to other settings. 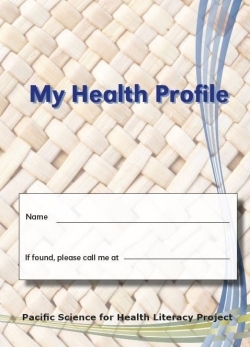 All Year 9 students in Raortonga will receive this booklet to record their health profile. Teachers will incorporate exploration of the profiles in the cross-curricular learning modules associated with the project. Public health will ensure that appropriate follow-up is available. Students have requested that this check be available to them annually during secondary schooling. Evaluation of the impact of this resource from the perspective of students, their families, teachers, school leaders and the Cook Islands Ministries of Health and Education will be made available here once this is complete. A downloadable ecopy of the resource is available here.